Jon Huntsman for Speaker of the House! 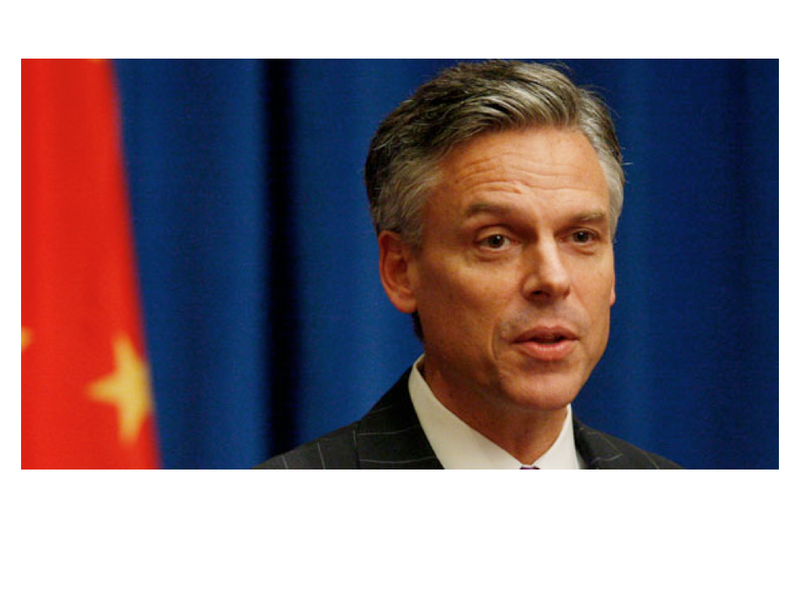 Congress should elect Jon Huntsman for its next Speaker. Well, perhaps not Jon Huntsman specifically, but some moderate Republican (there are a few) who would appeal not only to those in the Republican Party who want to get things done in Washington, but also to most Democrats, who also want to get things done. Perhaps Ray LaHood, a former Republican congressman who served as Secretary of Transportation under President Obama, would be a good choice, or even former New York Mayor Michael Bloomberg. But we are getting ahead of ourselves. First, we need to discuss why this has come up. Under pressure from the far right in his party, Speaker of the House John Boehner announced on September 25 that he would resign as Speaker effective the end of October. Boehner still clearly enjoyed the support of a substantial majority of his party’s members in the House. But to understand why he ultimately decided he would need to resign or face an embarrassing vote that would remove him, one must understand the rules and customs followed in the House. Traditionally, the congressional members of each party (Democrats and Republicans) vote in a unified fashion for whomever has been elected the leader of their respective party in the House. The election of party leader might well be subject to a competitive election among the party members. But once a party leader is chosen, 100% of the congressional members from that party have traditionally then voted for that leader in the election for the Speaker position. Thus whichever party has a majority in the House, will elect its leader to the Speaker post. But there is no rule that one must follow this tradition. Members of a party can vote for someone else as leader. And that has become increasingly common in recent years. Ten Republicans did not vote for Boehner as Speaker in January 2013, and 25 did not in January 2015. While those numbers seem small, and indeed are small, not many are necessary. By House rules, the person to be voted Speaker must receive an absolute majority of the “votes cast for a person by name” (thus excluding those absent, as well as excluding those voting “present”). If the majority party in the House has a majority of only a relatively small number of seats, then a few renegades who decide not to vote for their party’s chosen leader can deny that person the Speakership. In the current 114th Congress, which was elected in November 2014 and took office in January 2015, Republicans enjoy a quite substantial majority, with 247 seats vs. 188 seats for the Democrats, or a majority of 30 seats. This is indeed the largest Republican majority in Congress since 1929, when Herbert Hoover was elected president. But had just 30 Republican members decided not to vote for their party leader (Boehner) to become the Speaker, then he would have been denied the position (assuming all House members are present and vote for a person). Thus the revolt that led to 24 Republican members to vote for someone other than Boehner (plus one voting “present”) in the January 2015 vote for the Speakership, was significant. It was, and was clearly intended to be, a warning to Boehner that the minority of the Republican members on the far right of the party were willing to vote against their own leader, if that leader did not act as they wished. Following up on this threat, Representative Mark Meadows of North Carolina (one of the Republicans who voted for someone other than Boehner) introduced a motion on July 28 to “vacate the chair”. This could have acted as a vehicle to force a vote on Boehner as Speaker. Faced with this, Boehner faced the choice of either caving into the demands of the extreme right in his party, or gotten critical legislation passed to allow the government to continue to function from October 1. Failure to pass such legislation would have been an embarrassment. The legislation was necessary so that government departments could continue to spend funds with the start of the new fiscal year (as the Congress has not yet passed a budget for the year – a common occurrence). Democrats supported keeping the government open, as did a substantial share of the Republican majority. Together they could pass such a bill. But they are only allowed to vote on measures in Congress that the Speaker chooses to bring up for a vote. This is what makes the Speakership such a powerful position. But if Boehner brought up such a bill, members on the extreme right wing of his party made clear that they would vote against Boehner in a vote on the Speakership. With only 30 such votes necessary for Boehner to lose such a vote (amounting to just 12% of the 247 Republican held seats in the Congress), Boehner was in a bind. He was being held hostage by a small minority within his party. Boehner has of course faced this dilemma before. So far he has chosen to try to work with the extreme right wing. But as this became more and more difficult, as their demands became more extreme and as their criticism of Boehner grew, ultimately Boehner decided all he could do was resign. Losing such a vote for the Speakership would be terribly embarrassing. Better to resign first, and at least go out on your own terms. Following his resignation, Boehner did indeed bring to a vote a bill to fund the government for almost two and a half months (until December 11). And it passed easily, by a majority of 277 in favor and 151 opposed. It received 186 votes in favor from the Democrats (all Democrats who voted) and 91 votes in favor from the Republicans (with 151 opposed). It appears now that the current Majority Leader Kevin McCarthy will succeed Boehner, through the traditional process. McCarthy appears in most respects to be similar to Boehner in his approach, although somewhat closer to the right-wing of his party than Boehner was. But Boehner’s resignation and the expected selection of McCarthy to the Speakership changes little if anything. There will be the need to pass a budget to fund the government by December 11, or we will once again be in the same situation as this past week. The extreme right of the Republican members have made clear that they still want what they want, and that if that means shutting down the government, then that is a price they are willing to pay. Even before December 11, it appears that the government will hit the debt ceiling. Congress sets the debt ceiling, and Treasury Secretary Lew stated in a letter to Congressional leaders on October 1 that they now expect to hit the current ceiling on or about November 5. Unless Congress acts by then, the US would be forced to default on its financial obligations. Once again, a broad majority in the Congress, made up of Republicans and Democrats together, would certainly vote in favor of a bill to address this. But they can vote on such a bill only if the Speaker allows a vote on it, and the extreme right wing of the Republican members see this as leverage to get what they want. By threatening to vote out the Speaker if he does bring up such a bill, they can hold the Speaker hostage to their demands. Thus there is every reason to expect gridlock to continue, despite Boehner’s resignation and the election of a new speaker such as McCarthy. Can anything be done? Yes, the members of congress have it within their power to address this. Platitudes (such as we will all work together, or will work harder together) will not suffice. Rather, one needs to address the traditional practices of the current system that empower a small minority within the majority party to hold hostage the Speaker to their demands. This can be done by going outside the traditional system in the choice for Speaker. There is nothing in the Constitution that requires the Speaker to be a member of Congress. While the Speaker has historically always been a member, the Constitution does not require this. All the Constitution says on the institution is in one line at the end of Article I, Section 2, where it states the “House shall choose their Speaker and their Officers”. Anyone can be so chosen. To change the dynamics, one needs a Speaker who will draw support from the large majority of members who do not represent the extremes of either party. The Speaker role would change from highly partisan party leader, to a more balanced mediator who seeks a consensus that may well cross party lines to move needed legislation forward. With Republicans in the majority, the person chosen should be a Republican. But he or she should be someone who can work with both sides to try to reach a consensus that spans the broad middle ground, thus ending the current system that allows a small minority to hold the Speaker hostage to their demands. Jon Huntsman might be such a candidate. He might in particular be appropriate given his recent work as Co-Chair of “No Labels”, a bipartisan group that has proposed a set of process reforms not only to get congress to work, but also the presidency and government more broadly. I would not necessarily endorse all of these proposals (and some are pretty broad and vague), but thinking along such lines will be necessary if we are to see an end to gridlock in Washington. The new role of the Speaker would be to seek a broad consensus on issues, crossing party lines, and bringing to the floor measures that will be endorsed by a majority rather than voted up or down on strict party lines. Voting solely on party lines is a characteristic of parliamentary systems, such as that of the UK. Such a system works fine to move an agenda forward when the chief executive (the Prime Minister in a parliamentary system) is the head of the majority party in the parliament (or of a coalition that constitutes a majority). But the US Constitution did not establish a parliamentary system. Rather, it established a system with a separately elected chief executive (the president), who runs the executive branch of government and where the government is made up of three equal and separate branches: the executive, the legislature, and the judiciary. Voting solely along party lines, as has become common in recent years in the Congress, works fine in a parliamentary system but not in the system of government established by the US Constitution. This will not change as long as the Speaker sees his role as primarily that of a partisan leader of his party, rather than as a mediator seeking to produce a consensus on needed legislation with this then passed by a majority of members from both parties representing the middle rather than the extremes. As long as an extreme can hold the Speaker hostage, he or she will not be able to act as such a mediator spanning the parties. With such a change to this new type of Speaker, one can foresee a large set of measures passing soon, as a majority in the Congress have been in support. These include not only necessary upcoming legislation such as for the budget and a bill to raise the debt ceiling, but other items as well. For example, the previous federal highway funding bill expired in 2009, but since then Congress has not been able to pass any long term extension. Rather, Congress has passed 34 different short term extensions to keep road funding going, and with just these numerous short term extensions, states and localities could not plan in any reasonable way. The Senate finally passed a longer term (six year) reauthorization this past summer, but the House has yet to act. There is also a broad consensus on the need for immigration reform, and the Senate passed such a bill in 2013. And if one aimed at achieving a consensus in the middle, rather than appealing solely to one side or the other, one could envisage progress on bills that would address the underfunding and poor management of the VA health system. One could even see measures to address the high cost of health care (instead of seeking to score political points by calling Obamacare an abomination despite its success in extending insurance cover). None of this is realistic, of course. I have no expectation that Washington will change. The point, rather, is that gridlock is not a necessary outcome of the system, but rather a choice that has been made. Members of Congress have it within their power to change how their Speaker is chosen, and thus ensure the Speaker will abide by the interests of a majority in the Congress rather than a minority in one party. This entry was posted in More Political than Economic and tagged policy, Republican campaign, US politics by aneconomicsense. Bookmark the permalink.